Image of Newstead's Triffid. Source: Supplied. Brisbane’s live entertainment landscape will dramatically change in mid-2019 with the addition of a $40 million, refurbished, event, theatre and function space for up to 3,300 people on the Brunswick St Mall, Fortitude Valley. 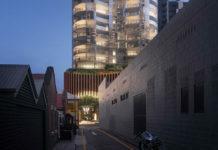 The site at 312 Brunswick St has been purchased by the team who own and operate The Triffid, with a private entity led by Scott Hutchinson of Hutchinson Builders, to create a new multi-use venue on the 2,500m2 site. The 312 Brunswick project will fill the need for a mid-sized venue left by the closure of the 4,500 seat Festival Hall in 2003. 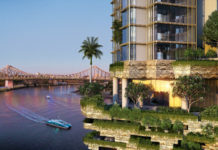 It will also meet growing demands for an alternative to the current larger and smaller event spaces and live music venue options in Brisbane. Previously the Optus Centre, 312 Brunswick will be repurposed as a theatre and functions facility that will reactivate the Brunswick St Mall, offering a mix of around 1,000m2 of retail, food and beverage tenancies. 312 Brunswick is a passion project for Mr Hutchinson, in collaboration with Paul Piticco from Secret Sounds Group and former Powderfinger member John Collins, who all operate The Triffid in Newstead. John Collins at the Triffid. Source: supplied. Mr Piticco’s company Secret Sounds founded and operates the iconic Splendour in the Grass, Falls Festival, and other major tours, festivals and music events around the country. Mr Hutchinson, Mr Piticco and Mr Collins are all champions of local live music. Mr Hutchinson has a deep personal connection and passion for the music scene as a fan and Patron of QMusic, the organisation behind BIGSOUND. Mr Hutchinson said the project will not only fill the void left by the closure of Festival Hall in 2003, but would also create a state-of-the-art live entertainment venue to attract artists who wanted to play to audiences of up to 3,300 people. 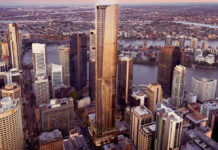 “Brisbane is an incubator for live music and a touring destination for a range of Australian and International artists. 312 Brunswick will offer a new space in the heart of Brisbane’s live music precinct to support and generate more music artistry,” he said. The Triffid in Newstead. Source: supplied. “It’s great to have local entrepreneurs helping to create new lifestyle and leisure opportunities in Brisbane – particularly in the redeveloped Brunswick St Mall,” said Lord Mayor Graham Quirk. “This is yet another venue that will add to our reputation as having a world-class entertainment scene”. 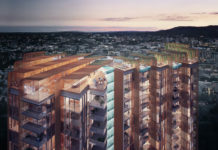 The initial vision for the project sees the building exterior reflect a modernised 50’s facade as a tribute to its original life, which will be a focal point in the newly redeveloped Brunswick St Mall. The interior will be purpose-designed as a live venue by the same acoustic and service team that designed The Triffid. Work on the property is expected to commence in January 2018. The property was sold by EG Funds and the transaction was handled by CBRE. Location of new entertainment venue.